I am trying to figure out a way to retrigger the playback of a sound when it´s finished, to loop a single sound (I am aware it will not loop perfectly, I am mainly interested in just repeating the sound). One way that works is using the asyncPlayVoice with a delay that corresponds to the sound length, but I was hoping to have a more general code that works with any sound without having to specify the length. I tried using playVoice (which plays the sound to the end before moving on in the code) and then check the busyPin. When the playVoice has finished, I detect the pin to be low, but I am not able to retrigger any sound either using the asyncPlayVoice or the playVoice command. I also tried with reset first, but nothing happens. I added a serialcheck so I know that the code is checking the pinstate and detecting that it´s low. Also, is there any way of looping a single sound when using the module without arduino? I assume it´s only possible to use the next/prev control? 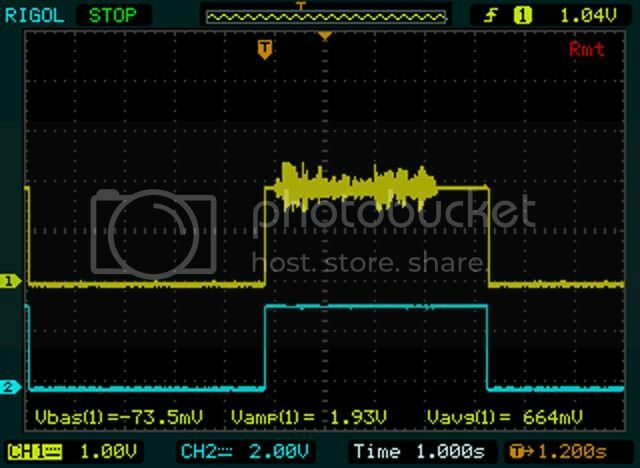 The top trace is the voltage on one of the speaker pins, the bottom trace is BUSY. The time scale is 1 second per division. The line actually goes low when the device switches to standby. BTW, it draws about 2 ma in standby as opposed to maybe 100 ma average when playing a loud sound. So when trying to loop a sound using BUSY as a trigger there will be at least a one second gap in between plays. But there's another quirk--if you try to send another play command immediately after BUSY going low, it will be ignored. I find by trial and error that you need to delay about 10 ms after BUSY goes low to successfully wake the chip up again with a play command. -- send play command, etc.